Most funds are disbursed using traditional payment methods, but payers are beginning to test emerging payment methods. Boston, February 13, 2019 – In the U.S. economy, B2C disbursements have traditionally been made via mailed checks and more recently have been made using ACH. 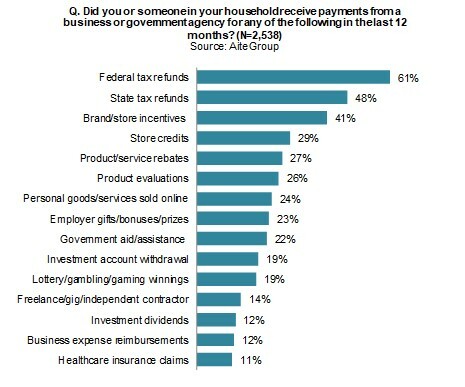 But checks are a high-cost payment instrument, and ACH is not always fast enough for today’s on-demand consumer. As the U.S. moves to a real-time payment infrastructure, 21st century businesses will need to migrate away from ACH and check to real-time digital payments to meet consumer demand across use cases. This Impact Report examines the state and size of the U.S. B2C disbursements market and the payment methods used to make disbursements. It is based on a quantitative consumer study commissioned by Ingo Money and conducted by Aite Group in Q2 2018. The survey included U.S. consumers aged 18 years or older who received a funds disbursement in the 12-month period from June 2017 to May 2018. This 29-page Impact Report contains five figures and 18 tables. Clients of Aite Group’s Retail Banking & Payments or Wholesale Banking & Payments service can download this report, the corresponding charts, and the Executive Impact Deck. This report mentions Allstate, Amazon, Apple, FIS, Lyft, Mastercard, PayPal, Samsung, The Clearing House, Uber, Venmo, Visa, and Zelle.